So some of you are off for summer vacation and want to read a great novel that has apples and oranges in it. Well, you’ve come to the right place! Eyes of the World was written by Harold Bell Wright in 1914. It takes place in a cottage among the orange groves in Redlands and in an abandoned apple orchard in Forest Falls in the San Bernardino mountains. The sweet heroine packs a revolver in the mountain settings and ain’t afraid to use it, endearing her to my heart. Wright was a minister who retired to write novels, as he felt he could better reach the world with the Gospel through his writing than his preaching. He chose wisely, as his novels were a smash hit, and Shephard of the Hills was made into a movie starring John Wayne. Finally, Wright wrote The Winning of Barbara Worth, the best Civil Engineering novel I’ve read (OK, the only Civil Engineering novel I’ve read). It follows the series of events that accidentally created the Salton Sea in the desert of California. Click on the links to download any of these books for free (it downloads really fast). I warn you they are all very good and once you start, you won’t be able to put them down. These novels were written in a more civilized time, when California was just coming of age. I wish I could have been there; and Harold Bell Wright’s novels almost take you back. Great Britian has a long heritage of apple growing stretching back to Roman Times. Varieties we think of as quintessential American may be actually British; White Winter Pearmain comes immediately to mind. Brogdale Horticultural Trust is where the National Fruit Collection is housed, where full-sized trees are grown of 1,882 varieties of dessert and cooking apples, and 92 varieties of cider apples. The collection was almost relocated, which resulted in a classic British row over it, but it has been settled and the collection is safe and endowed in place. Photos and descriptions of the ascensions are posted on their website, and the Collection is available for tours and tastings if you happen to be in Faversham, Kent. Their website www.brogdale.orgis wonderful and also has advice for growing fruit, albiet in a much different climate than ours. Joan Morgan has eaten her way through the entire collection and has written taste descriptions of them in her wonderful book, “The New Book of Apples“, required reading for any apple aficionado. It is worth the purchase just for the wonderful watercolor illustrations of classic British apples. I’ve been corresponding with Joan about my experiences growing about a dozen English apples in a hot climate, which she did not think possible. She will be posting some of this correspondence on her Fruit Forum. I sent her a ton of stuff, so it may take a while for her to sort through it and post it. Several years ago we had to replace a tree at a local high school that was killed during a construction project I was managing. The principal asked me what kind of tree they should put in; I had just finished a Fuji apple for lunch, so I told them a Fuji apple. Thus the architect issued the edict; so let it be written, so let it be done. It turns out this was the first time in memory an apple tree was planted in the district, and there was all kinds of concerns of the consequences; students would steal the fruit, throw it through windows, eat green apples and have tummy aches (and thus miss school), rats and vermin would move in, and bees would sting people. None of this came about, probably because no one knows its there. The tree (centered in the photo above) blends in so well with the rest of the landscaping that thousands of kids walk right under it every day, oblivious to its presence. The custodian said its no extra trouble at all (and believe me, if it added one minute to his day, I’d hear about it). I asked if they tried the apples, and they said no, they thought they were poisonous and raked them up and threw them away. You may snicker at this, but this is the state our society is in; fruit comes from the supermarket, not a tree, so anything in the landscape must be poisonous. I assured him they are not only not poisous, but will be the best apple he’s ever tried. That fall he emailed me and agreed that they are the best apples they’ve ever tasted, and now they stand on the golf cart to pick their fill. This was the start of our planting apple trees on campuses in the district. This is about the time of year I start looking for codling moth damage. The tiny moth lays an egg on the bottom (calyx) end of the apple and the hatching maggot tunnels into the core, where it grows and feeds. This damage makes the apple drop on the ground, where the maggot exits and pupates in the leaf mold into an adult moth. However, there must be something that controls the population, as in our long season multiple generations can grow in a season and they would quickly take over; but as it is I only lose about a couple dozen apples from the 100 trees we have here. I don’t know if its the heat, predators, or dry climate that controls them, but I have no active control program. If it got any worse there are steps I could take short of spraying repeatedly like commercial orchards do; the moths are attracted to round red things, so there are these lures that look like a red croquet ball that you cover with sticky stuff that traps the moth. Others use a trap that has molasses and vinegar. 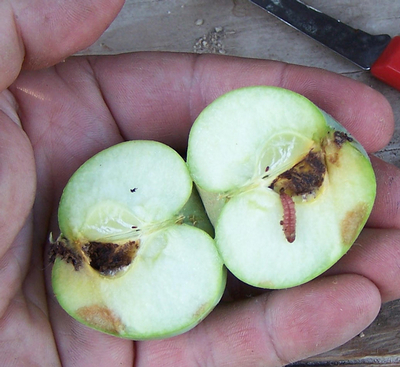 A telltale sign of infestation is a hole on the apple, often on the calyx, that has what appears to be dark brown sawdust coming out of it. It is important to pick these off the tree and collect them off the ground so the maggot won’t escape to mature. Farmers used to run hogs and geese in the orchard which would take care of these infested dropped apples (and you’d get apple-fed bacon in the fall). They seemed to prefer some varieties; the Fuji tree will have a bunch while Pink Lady has none; I don’t know if the tree location, blossoming time, or leaf cover has anything to do with this. Each region has its first early apple. In New York it is Yellow Transparent, ripening the end of May (it ripens here in September; go figure). It has a thin, opalescent skin, turning a pale yellowish-green. It goes from green and tart to ripe, sweet, and mushy in about five minutes, and keeps about as long off the tree. It is usually cooked into sauce. 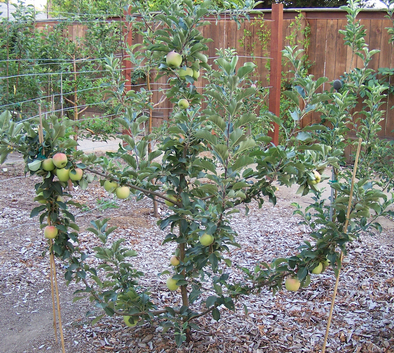 Our early apples are Anna and Dorsett Golden, ripening about a week or two after school lets out in mid-June. The maniac above is a two-year-old Dorsett Golden, with a typical crop. Next year it will have twice as many branches and I will have to prop each one of them up, as they will be full of apples. The apples are decent, with the poorly-colored ones in the shade being superior (go figure). They are tender, crisp, juicy, sweet with a bit of tart and a nice finish. We’ve juiced them for cider, and when mixed with Anna, it is really weird to taste a half-decent cider in June. Cider is a worthy use as the tree will bear a billion of them and they only keep two or three weeks, pretty good for a summer apple. I received a flyer from missionaries in Honduras that helped some indigenous people there grow Dorsett Golden and set up a cider pressing and bottling business. They also hold up well in pies, and we liked them chopped up and mixed in ice cream, flavored with a bit of cider also. It was discovered in the Bahamas, and will grow just about anywhere that doesn’t get spring frosts, from California to the tropics. It will bear apples as soon as it sprouts, this tiny 12″ tall tree bent over double with a big apple hanging from the tip. The blossoms are gorgous, pink against the bright green tiny leaves, usually the end of January. Not the highest flavored apple in the orchard, but admirable and worth growing none the less. 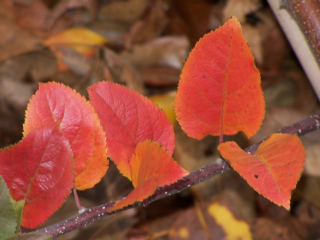 Everything about the tree is red; the flower buds are red, the leaves have a reddish tint, the wood is red, and the apples are red (inside and out). It is only suitable that this dwarfing rootstock was developed in the former Soviet Union by the late Dr. Budagovski at the College of Horticulture in Michurinsk. It is a cross between Malling 8 and Red Standard. I discovered these red attributes after a graft failed and I allowed the rootstock to grow out and fruit. The limbs are long and spindly, and the apples weren’t bad; rather small and a bit tart, would make good pies and cider, as well as interesting jelly. The fall foilage gives us a bit of color in an otherwise bland Southern California autumn, although they don’t turn until late December, so can you call that fall? 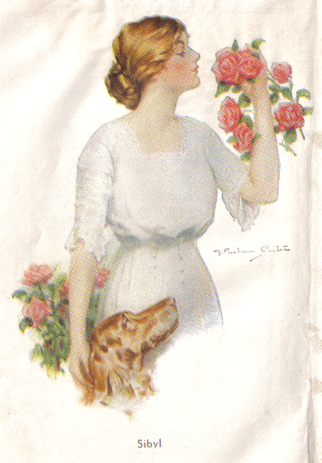 But where the tree is most valued is as a rootstock. It is very dwarfing, making a tree about 10′ tall. It is hardy down to 50 below zero (not that we care about that), and starts producing apples the second year. It bears heavy crops after that, making it an up and coming favorite for high-density training systems like tall spindle. The shallow, tender roots require staking for the life of the tree, and it is suceptible to drought. Our trees produce well with it, but it does have an odd habit of wanting to resist topworking where you graft a new variety onto a stump of a 2-3 year old tree. The graft just sits there through the spring, tries to leaf out, and dies. Meanwhile, the tree next to it grafted last year grows fine, as does the 1-year old rootstock planted in a pot. The potted trees above are this year’s crop that I grafted for Riley’s Farm in Oak Glen. Last year we planted them directly into the ground, but I think the pots will work out much better. They require attention the first few months, cutting off root suckers, training up bamboo sticks, and pinching off side shoots. When planted in the ground at 20′ spacing this required hiking along about a 1/2 mile route to service the tiny trees, which were also subject to deer and weed whacker damage. Having them in pots makes them easier to water, and the crowded conditions also cause them to grow up straight to compete for the light. The appletrees are destined for the terraces on the left, about the center of the photo with kind of grey grass and the lone tree (this year’s planting is the green terraces just below it). These terraces were cut by Blackie Wilshire before WWII. 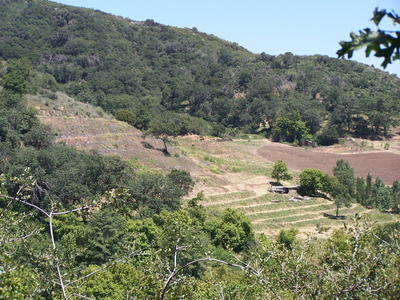 The apple trees serve a double duty as a firebreak between the wild brush on the hillside and the cultivated farm. There’s something about grafting for a large planting like this, as I’m contributing to the history of the farm and the happiness of thousands of people that will pick and enjoy these apples in the coming years. They will most likely outlive me; and so I strive to leave a legacy of both apples and a testamony of God and His creativity, kindness, and redemption to the generation after me. I help elementary schools plant their own apple orchards. As part of the deal I will arrange for the water supply, irrigation valve, and timer. 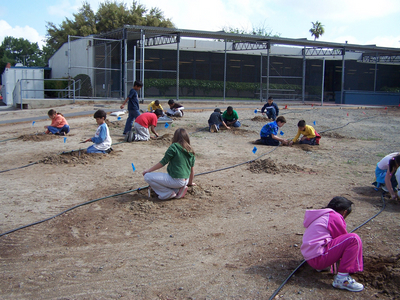 Sometimes schools will receive gardening grants for the drip irrigation supplies, which I help them design and install. Finally, I supply the benchgraft trees; after that, they’re on their own. Sometimes when I hand them the bundle of tiny trees, the coordinating teacher assumes I’m going to plant them also, and are a little flummoxed when I tell them its their baby from here on out. 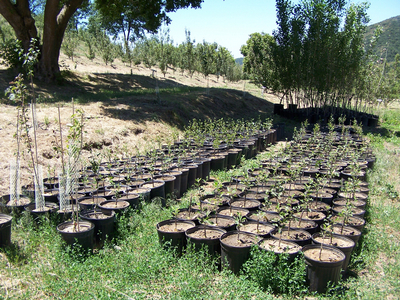 They will try to coordinate some parents to help, but the trees need to be planted right away, and more often than not they recruit the kids to do the planting. Several wonderful things happen at this point; the kids get the trees planted, the teachers are surprised on how well they did, I keep my sanity from not over-committing myself, and the kids take ownership of the orchard. When the orchard in the above photo first went in two years ago, the head custodian gave it about a month before he expected the drip hose to be stolen and the trees vandalized. Two years later it hasn’t been touched, and I credit that for the kids taking ownership. 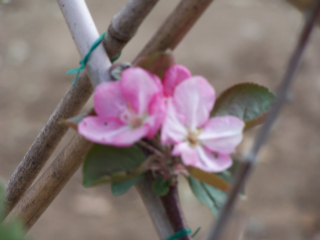 They have their labor involved weeding, staking, and noting the tree’s growth, and the orchard is no longer just an object at the school, but its THEIR orchard. As they grow up they can bring their kids back there someday and say “I remember planting those trees and watching them grow”. We cover the orchard with a thick layer of shredder chips to feed the trees, conserve water, and keep the weeds down. We get them free from an arborist, and sometimes can’t be too picky of when a load will show up. Last week they dumped a load at a school, but it is the end of the year and all the parent volunteers are gone. It was a huge pile, and the district’s Bobcat tractor was booked up. So instead the entire 6th grade got involved and moved the chips. They got hot, dirty, and stinky; in other words it was a way cool day! No doubt some parents will be horrified of this, but nothing could be better for them. They were a part of something that will be beautiful and productive, and may outlive them. At another school a beautiful garden full of flowers and shrubs was planted out front. Again, folks gave it a season before they expected it to fall into a dying, weedy mess from neglect. But the after-school program has the kids going out there daily, weeding and watering, and three years later, it is gorgeous (I snuck a couple of apple trees in there also). The principal has received critical comments from visiting administrators about the kids doing work out there, but ask any kid and they’ll tell you they love it. I admire their work every time I drive by. As you can see I’m all for child labor, because they get to see the fruit of their labor, and nobody has to tell them to feel good about themselves; they already do. They learn a valuable life lesson as see the value of hard work and realize that when you see an ugly problem, it can be dealt with in surprisingly little time, especially if they work together. And the garden or orchard is kept up much better then if someone just gave it to them already complete. It is all part of taking ownership.